Franklin Monroe MVCTC FFA members pause for a photo during the National FFA Convention. Members attending included (back row, l-r) Austin Cool, Morgan Baker, Clem Montgomery, Brendan Wray, Jacob Winterrowd, Walker Lindemuth, (front row, l-r) Kolby Rogers, Kaden Spirito, Morgan Hissong and Elisabeth Williams. 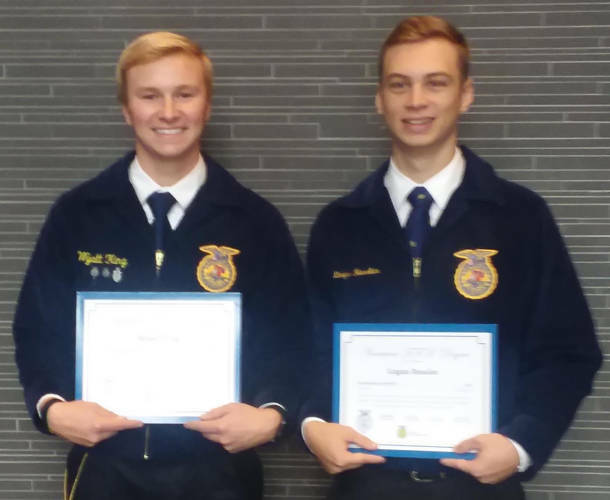 Franklin Monroe MVCTC FFA members who received their American FFA Degrees were Wyatt King and Logan Ressler. INDIANAPOLIS, Ind. – The Franklin Monroe MVCTC got a chance to be a part of the sea of blue jackets at the 91st national convention in Indianapolis, Indiana. The chapter attended the convention on a school bus along with chapters from Tri-County North and Mississinawa Valley high schools. Those who attended from Franklin Monroe were Jacob Winterrowd, Morgan Hissong, Elisabeth Williams, Walker Lindemuth, Brendan Wray, Morgan Baker, Kolby Rogers, Austin Cool, Clem Montgomery and Kaden Spirito. There were many great opportunities the Franklin Monroe MVCTC got to experience. During the trip to Indy the bus made a stop at a dairy goat farm that produced cheese on a local level. On Oct. 24 the group took part in the Garth Brooks concert, which was held at the Lucas Oil Stadium. The chapters also got the chance to attend sessions at national convention and visited the expo center. There also was a tour the group participated in at Elanco, which is a corporation that promotes and enhances animal health. 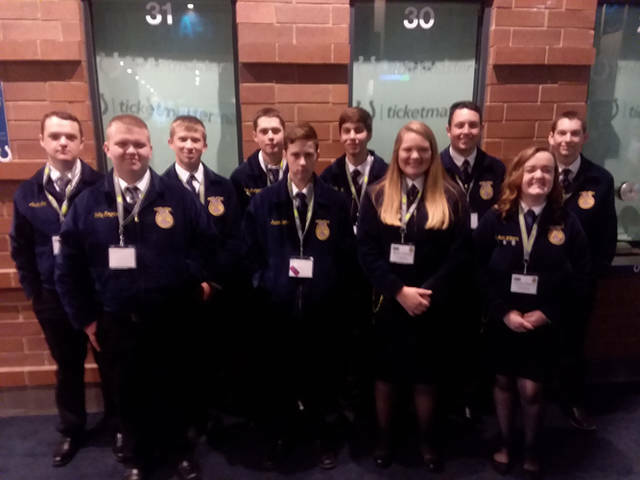 On Saturday the group attended Lucas Oil Stadium to see two past Franklin Monroe MVCTC members, Wyatt King and Logan Ressler, be awarded the American FFA degree. After the American degree session the group headed to the Banker’s Life Fieldhouse to hear from President Donald Trump. The Franklin Monroe FFA Chapter thanked Miami Valley Career Technology Center and the Franklin Monroe MVCTC FFA Boosters for helping to sponsor the trip.